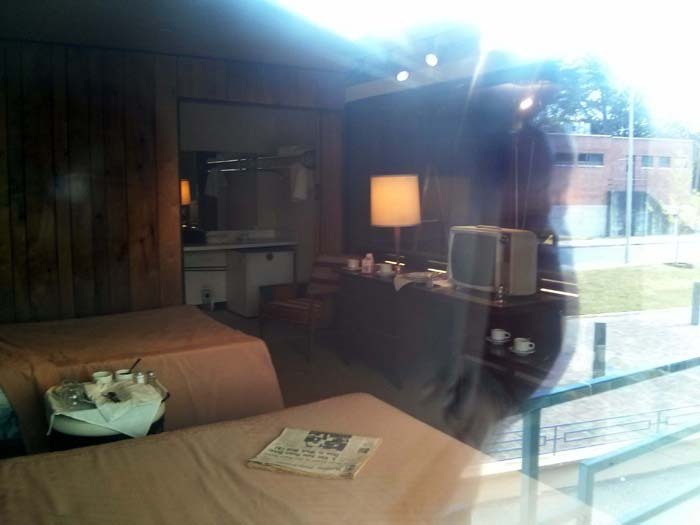 The upstairs of the museum – part of which is housed in the rooming house from where James Earl Ray fired the fatal shot (you can see the bathroom & window where he shot from) – is devoted to MLK’s murder. It’s interesting and well presented – and incredibly detailed – but it strikes me as being a bit of overkill in terms of how much information is shown. And there’s little if anything upstairs about the Civil Rights struggle. Downstairs there is some stuff about it but it seems almost an afterthought after the overload volume of data upstairs. The presentation downstairs is weird as well: lists, bullet points, pictures – for instance there is a display with lists of laws passed to rectify matters – but no analysis or commentary to explain anything. It’s kind of like they assume visitors know everything. 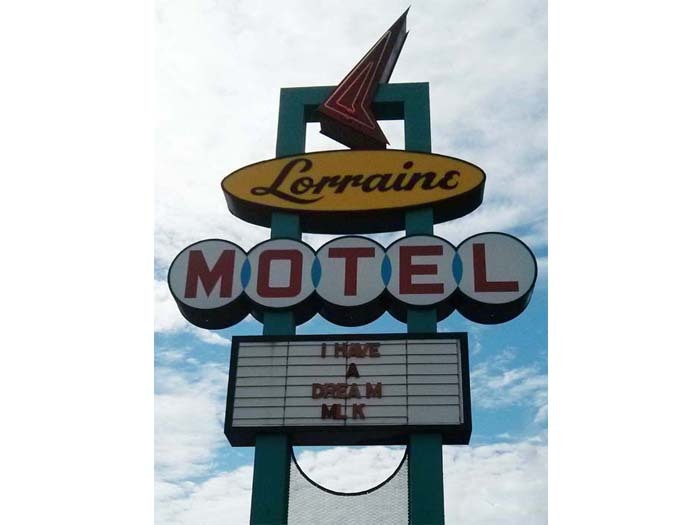 There’s nothing about the struggle, little about the injustices and wrongs inflicted on African Americans, the murders, the lynchings, the abuse. It’s all very strange and not what I was expecting at all – or, to be frank, what I think it should be. I learnt more about the issues and problems suffered by black people from the time I spent in the Delta than I got from the museum. It’s a missed opportunity I think. 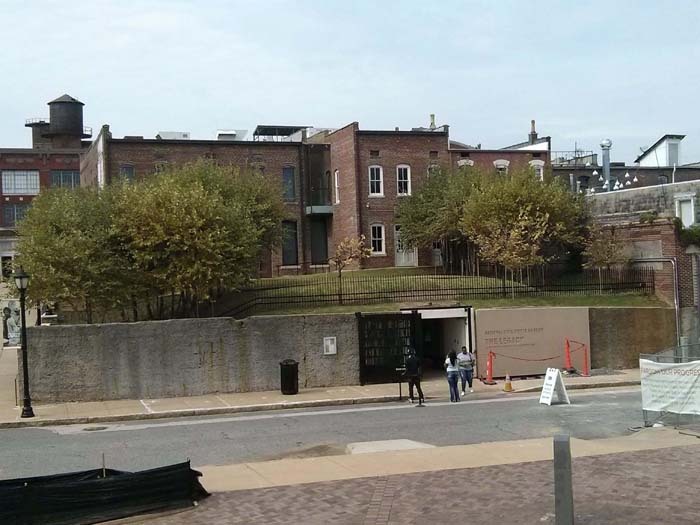 Many museums catalogue what went on in the past and I thought this one would do the same, to create a historical record of fact about the Civil Rights movement – “so we never forget”, as has often been said about what went on with the Holocaust for example. 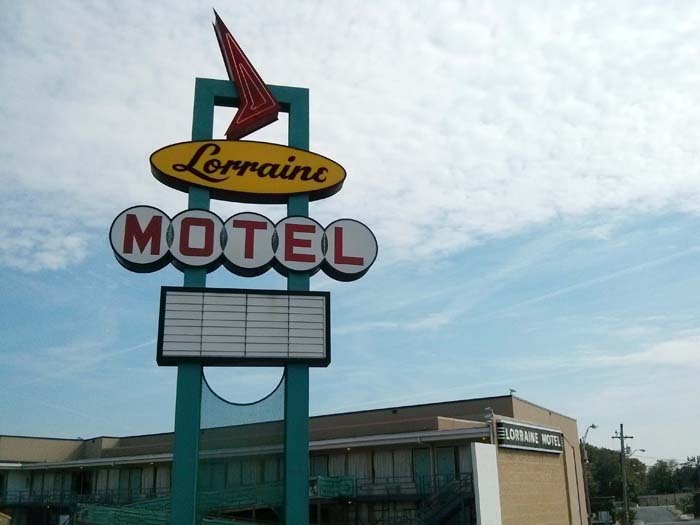 There’s the obligatory shop after which I return the Lorraine Motel. 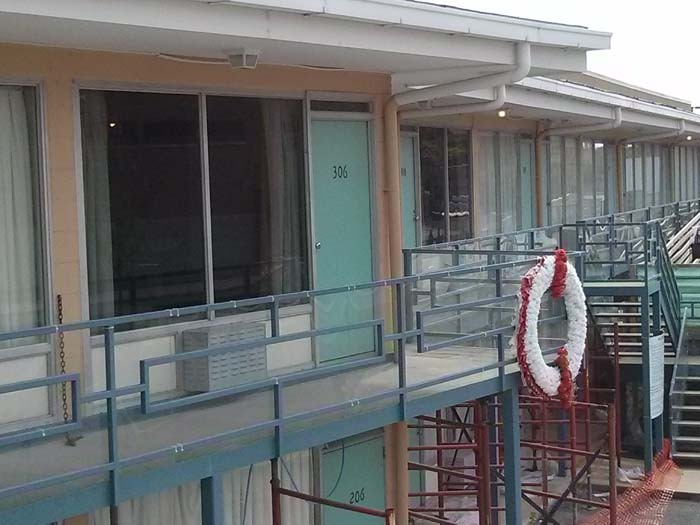 They’re renovating it at present and I was able to go up some stairs and walk along on the balcony in front of the bedrooms on the upper floor, to stand on the actual spot on the walkway where MLK was gunned down, and look into his motel room. You can’t go in but the room has been preserved just as it was on the day he died. I can also therefore look across back to the rooming house and see the line of fire Ray took. I learn from the guide managing access to the balcony that once renovations are complete, access up the steps to the balcony will be stopped. She didn’t know why but that’s the plan apparently at the moment. Very strange – it was quite moving to walk on the balcony and I think the museum experience overall will be poorer without it. So if you want to walk on the balcony, get there quick! After a sandwich for lunch from a grocery store on S Main St I walk back into the centre of downtown and find the Rock’n’Soul Museum for “the complete Memphis music story”. 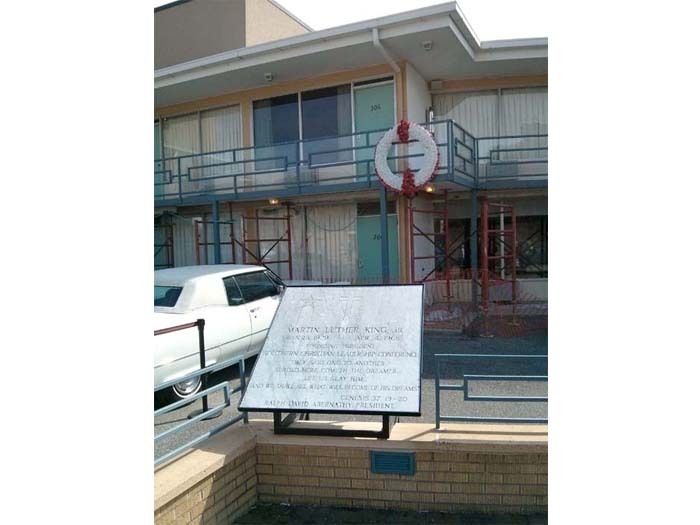 Now this is better: after an introductory film the exhibits are laid out in a timeline starting in the Delta of the 1920s – history, background, commentary – and go on to run through Sun, Stax and other things Memphis-orientated. There’s an excellent audio guide with headphones that guides me round plus the displays themselves all have lots of informative, additional content. It’s all very well done even if, as a music fan, I did know quite a bit of it already but it’s still a worthwhile visit all the same. The shop – I know, what a surprise, there’s a shop – has even more tat than is normal, which is saying something. No purchases were made. It’s a couple of blocks walk back to my hotel for a short sit down and rest before I head out again into Beale Street for dinner – and hopefully some more good music. I decide to try the Rum Boogie Cafe, which is a bar with a music stage. I have some food sitting at the bar and watch football and baseball on the ubiquitous TVs whilst also listening to some jive-type band called Davina & The Vagabonds. My, they do have pretensions to greatness. They start out with well-known ‘standard’ tunes and it’s OK but then they decide to “do one of own” according to the lovely Davina – and they lose the plot, going all weird ‘n stuff. Unfortunately this was not a one-off event and was swiftly followed by more rubbish “of their own”. However, whilst listening to this musical garbage in my right ear from dearest Davina, a connecting door to the left keeps opening and I hear some ‘proper’ music coming from within. The barman tells me it’s the Blues Hall Juke Joint and it’s part of the same building, so I head on in. There’s a load of blues memorabilia on the walls and some might even consider it a juke joint as it’s quite small and seems old-ish. Playing tonight is the Dr. Feelgood Potts Band – real R’n’B (proper old-style, not the anodyne Beyonce-like muzak that gets called R’n’B these days) – and they’re bloody good. No, they’re excellent. I sit at the bar downing beers and tapping my feet. It’s marvellous stuff but then at 11 pm the Blues Hall suffers an influx of loads of ancient Eagles fans dispersing from the FedExForum after watching their heroes on their umpteenth comeback gig. What the hell do Eagles fans know about R’n’B? Some of them start talking loudly and disruptively and heads starting turning from those of us on the bar stools to try and shut these cowboys up, but thankfully most of the old farts leave quickly and the intruders who remain then keep quiet and don’t ruin the excellent vibe and atmosphere Dr Potts has created. It’s a really good night of music and I stay until the band finish just after midnight, and then it’s time for bed.